The RapcoHorizon SP-1DFN XLR Single Gang Wall Plate comes with 1 Neutrik NC3FD-L-1 Connector. 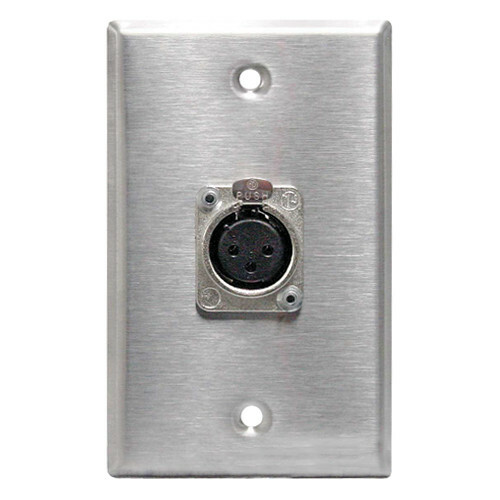 Box Dimensions (LxWxH) 6.8 x 4.0 x 1.15"
SP-1DFN XLR Single Gang Wall Plate with 1 Neutrik NC3FD-L-1 Connector is rated 5.0 out of 5 by 1. Rated 5 out of 5 by Patrick from Pulpit jack replacement Fit this Neutrik NA3FDM XLR Female to Male Feedthrough Adapter for Panel Mount into a RapcoHorizon SP-1DFN XLR Single Gang Wall Plate with 1 Neutrik NC3FD-L-1 Connector after knocking out the rivets, then re-riveting it to the plate. Then I fit it into a movable pulpit where the original jack had been abused and the soldered connections severed. In a church environment, who can fix that, and who needs downtime? Especially with very young and active kids!